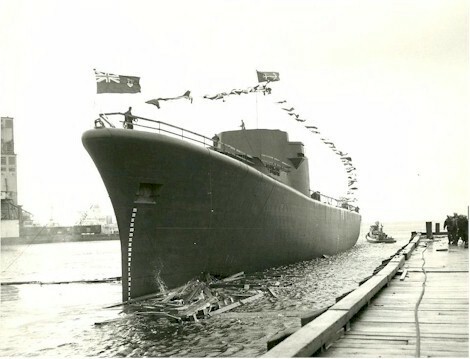 Built by Victoria Machinery Depot and completed by Yarrows at Esquimalt, Saskatchewan was commissioned on 16 Feb 1963, following which, from Jun to Oct 1963, she was based at Halifax. 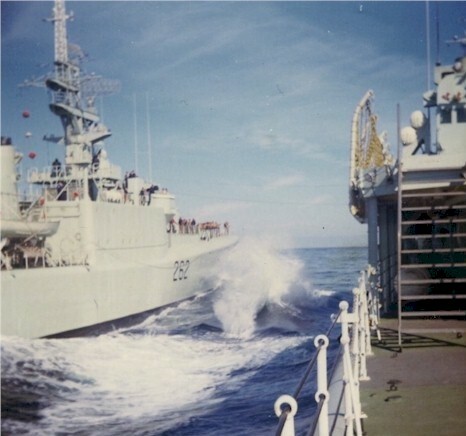 In Oct 1963, Bonaventure, Algonquin, Cayuga, Micmac and Saskatchewan took part in a NATO exercise in which all participating ships were battered by a severe North Atlantic storm (click here to see the newspaper article). 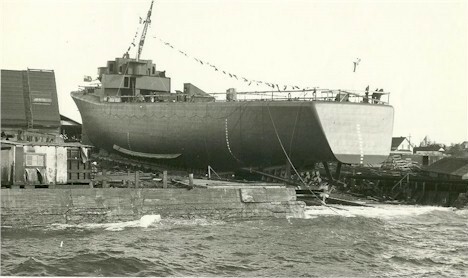 She then returned to the west coast. 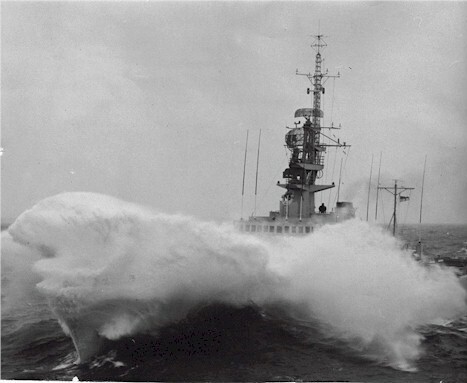 In 1968 she grounded while transiting Active Pass in fog. 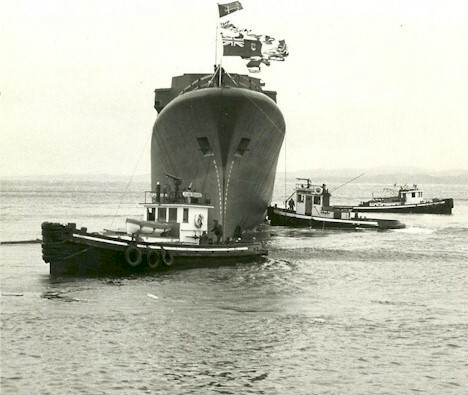 In Feb 1970, she returned to Halifax with the erstwhile crew of Kootenay, relieving Nipigon as flagship of SNFL that summer, but returned to the Pacific in 1973. 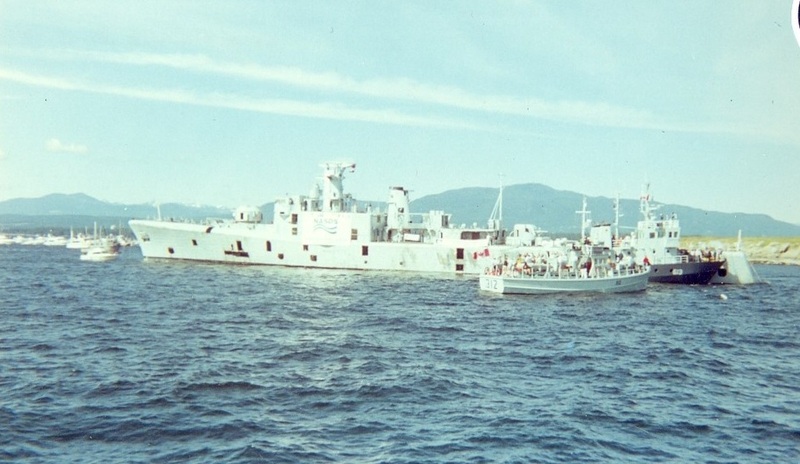 She was given her DELEX refit at Burrard Yarrow Inc., Esquimalt, between 27 May 1985 and 17 Jun 1986. 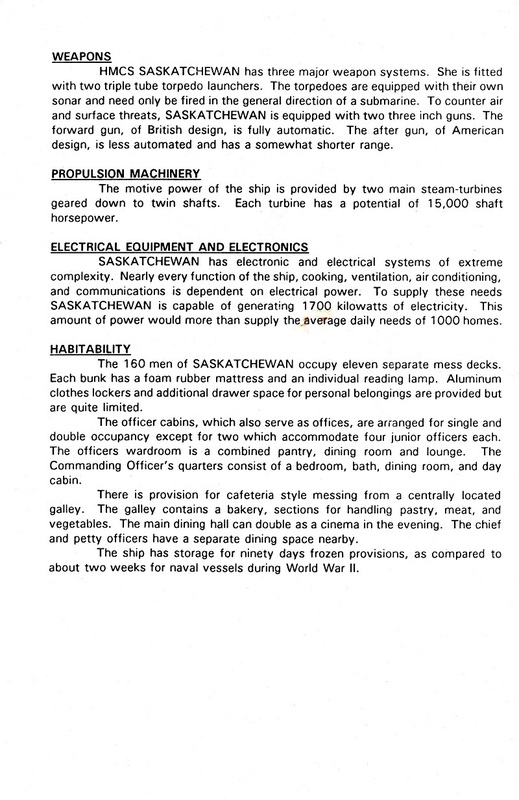 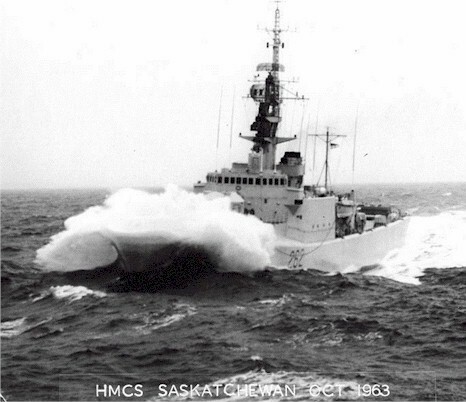 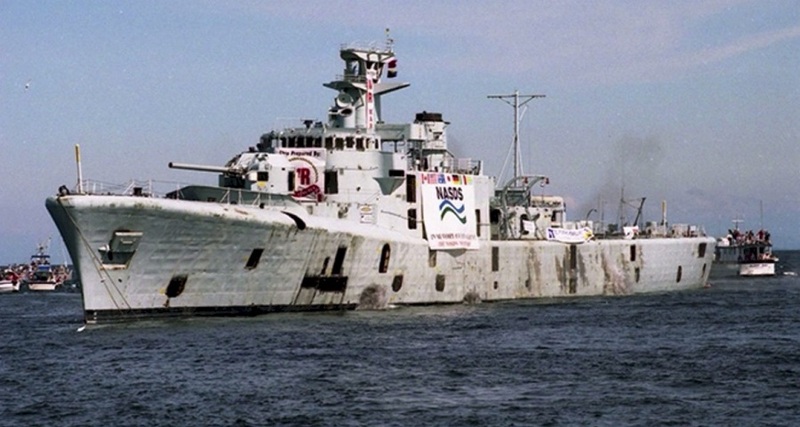 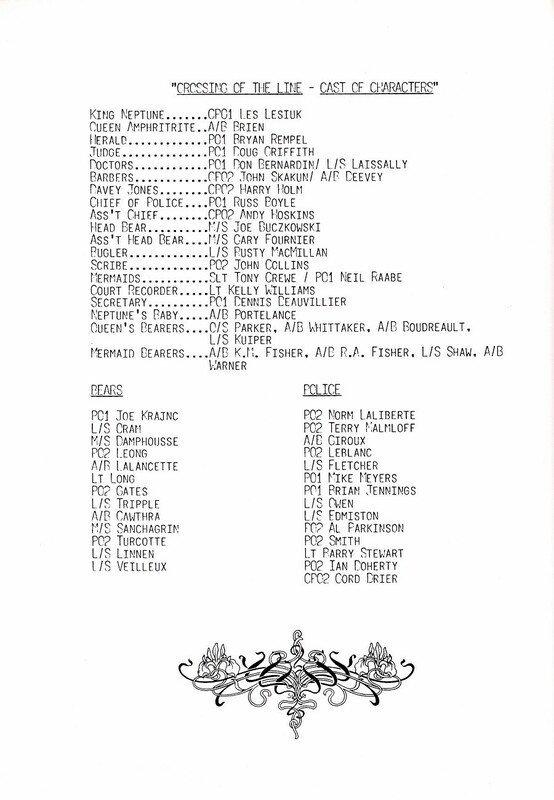 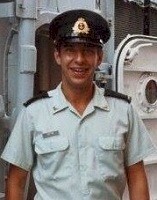 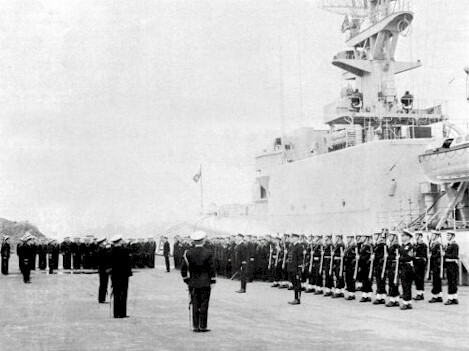 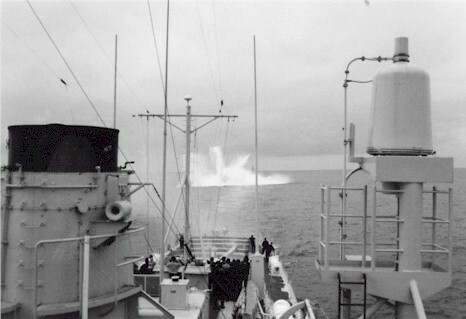 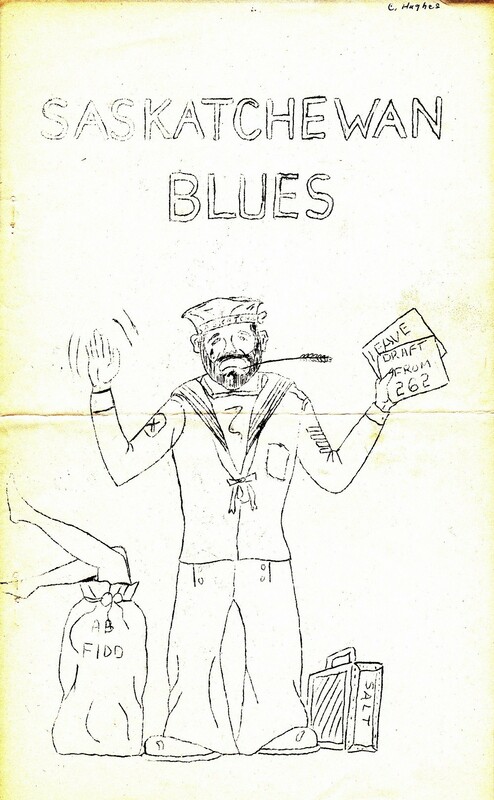 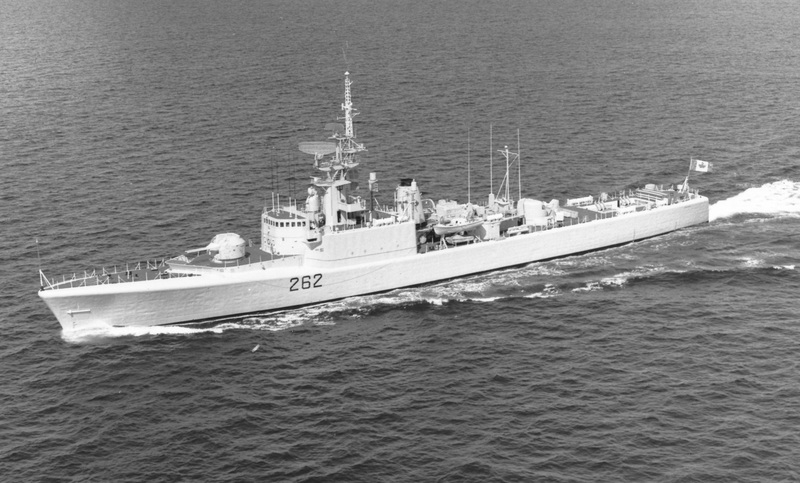 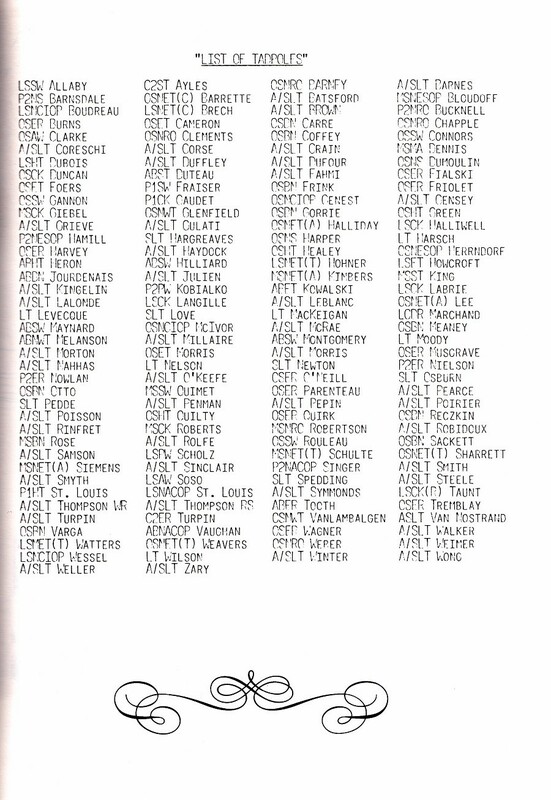 HMCS Saskatchewan took part in SOPLOY '86 from 25 Aug 1986 till 25 Nov 1986. 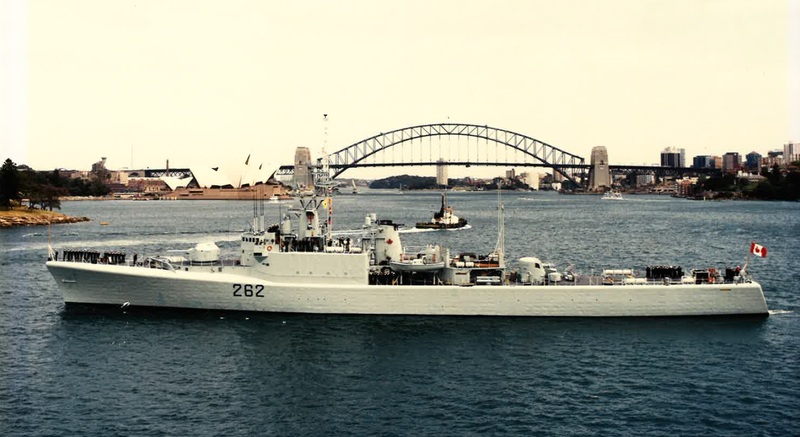 During that deployment Saskatchewan was part of a Canadian squadron that visited Australia for the RAN's 75th Anniversary celebrations. 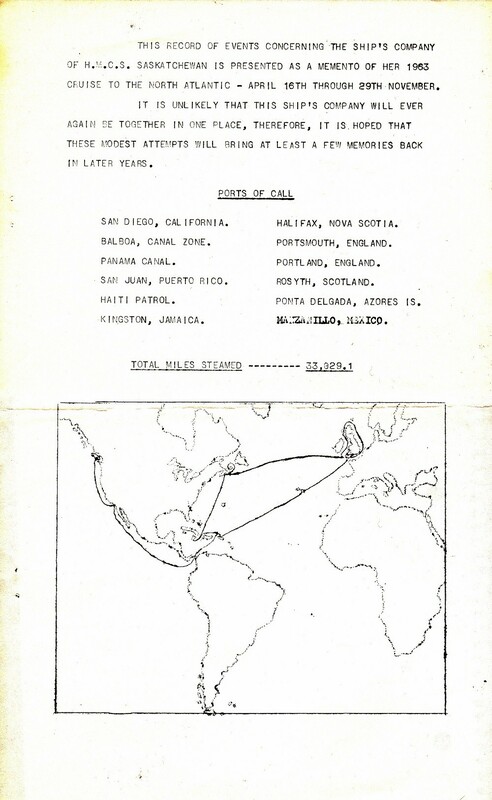 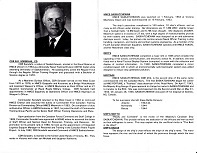 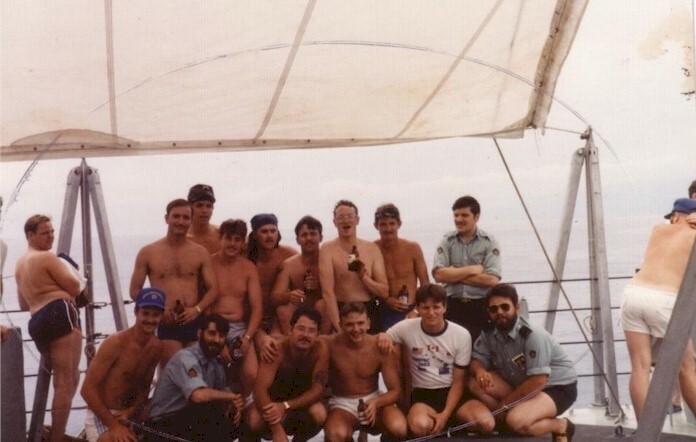 Port visits during SOPLOY '86 were: Pearl Harbor 3-6 Sep / 14-17 Nov; Pago Pago, American Samoa 14 Sep & 05 Nov; Suva, Fiji 18-20 Sep; Brisbane, Australia 25-27 Nov; Sydney, Australia 29 Sep-07 Oct; Melbourne, Australia 8-13 Oct; Wellington, New Zealand 22-23 Oct; Gisborne, New Zealand 24-27 Oct and Auckland, New Zealand 28-31 Oct 1986. 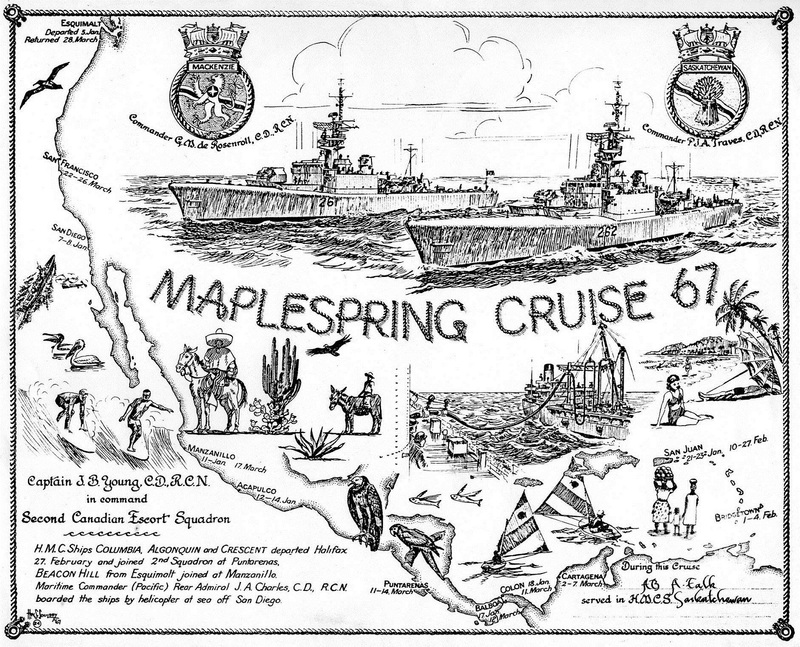 During the South American Cruise in 1989, Saskatchewan Crossed the Equator on 16 May 1989 and visited the following ports: Acapulco 05 - 09 May, Guayaquil 17 - 22 May, Caldera 27 May - 01 Jun, Puerto Vallarta 07 - 11 Jun, San Diego 16-19 Jun and San Francisco 23-26 Jun 1989. 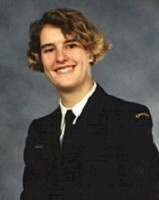 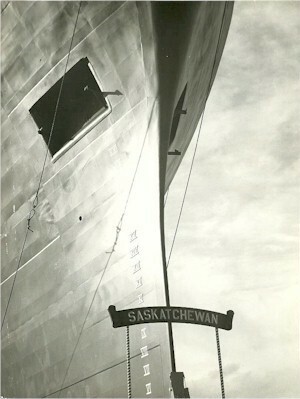 In her final years, Saskatchewan was a member of Training Group Pacific, instructing officer cadets in ship handling, navigation and marine engineering.  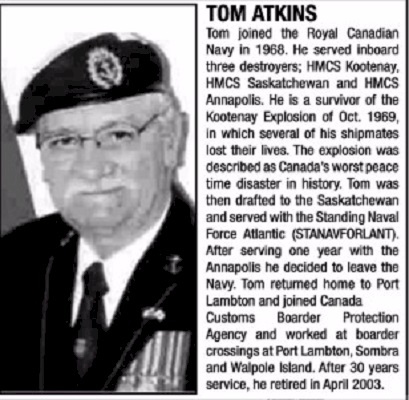 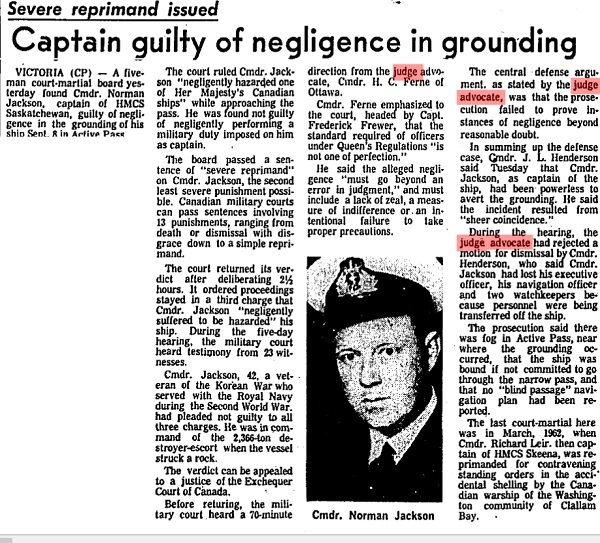 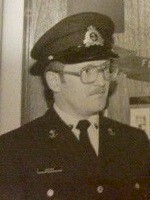 On 17 Mar 1994, barely six weeks before she was paid off, Saskatchewan lost two crew members, Slt N.P. 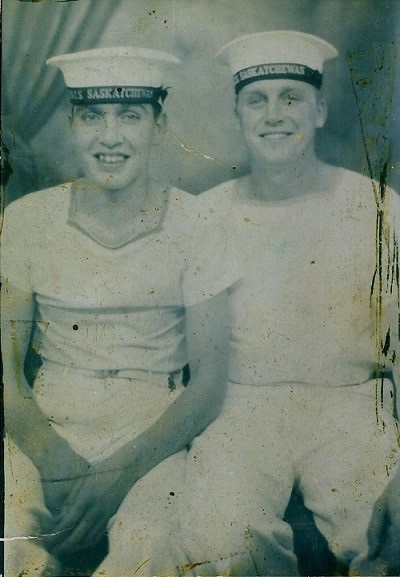 Schiele and AB S.J. 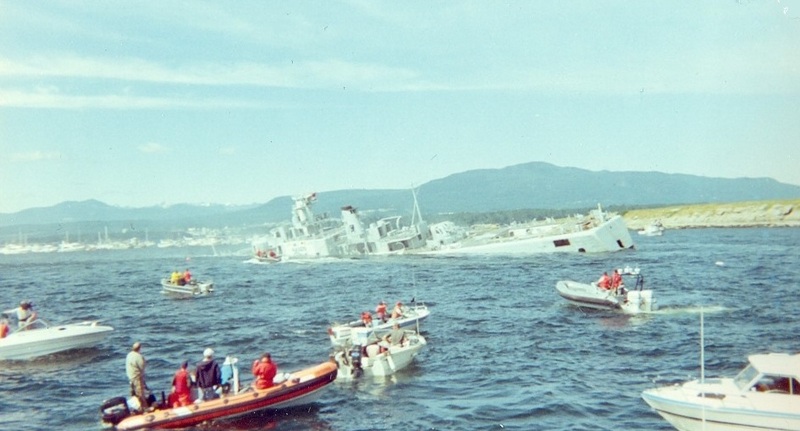 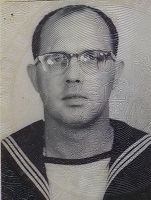 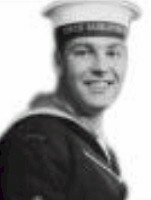 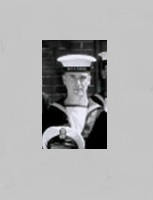 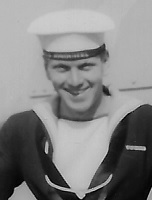 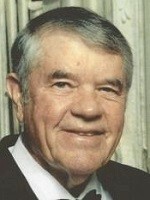 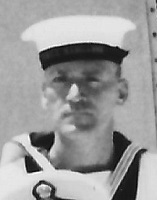 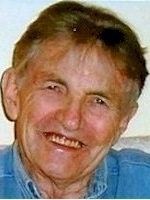 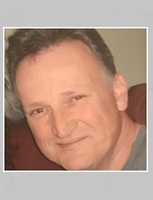 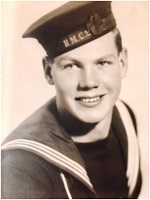 Schreurs, in a diving accident in Shoal Channel, Howe Sound. 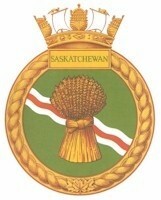 Saskatchewan was paid off on 01 Apr 1994, purchased by the Artificial Reef Society of B.C. 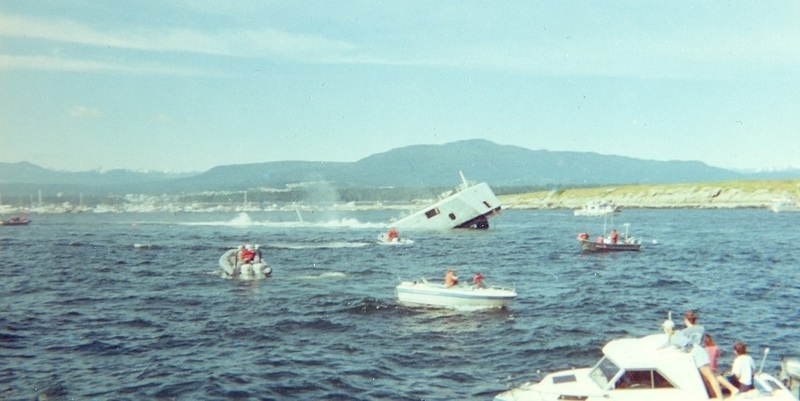 and sunk on 14 Jun 1997, near Nanaimo. 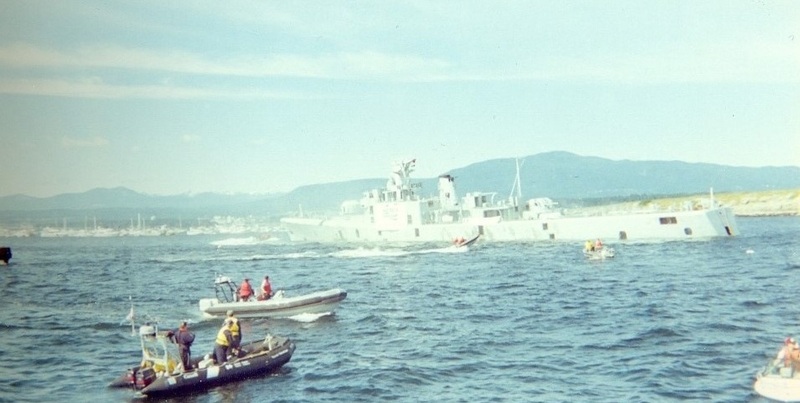 While on a routine training dive in Howe Sound with six other divers, their team encountered difficulties at depth and Slt Schiele and her dive partner died. 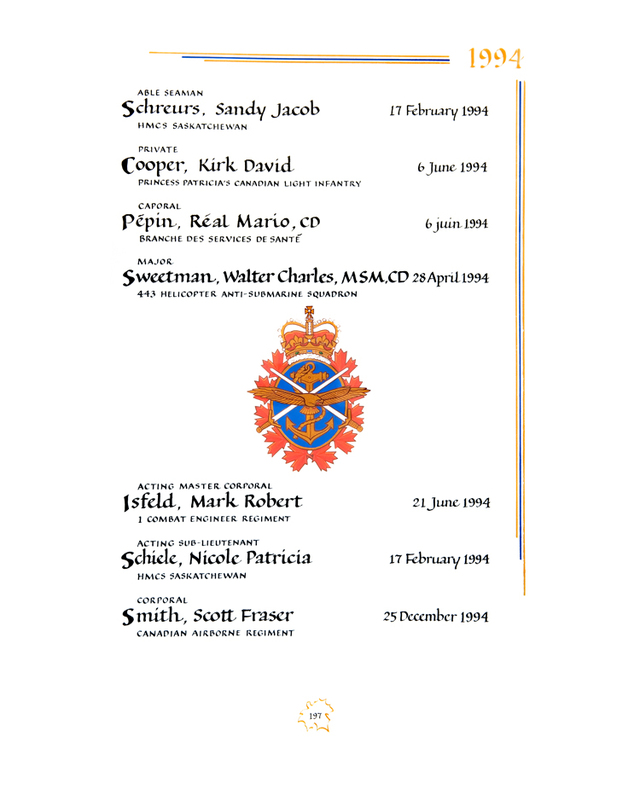 She was buried with full Military honours in Victoria, BC, on 25 Feb 1994. 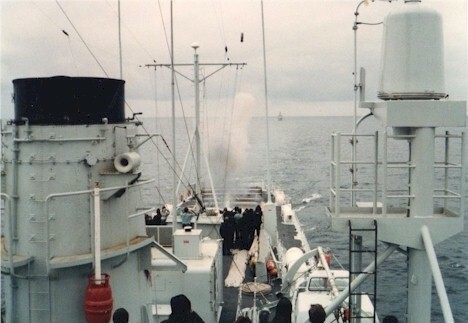 In the first photo you can see the mortar bomb just above the port yardarm. 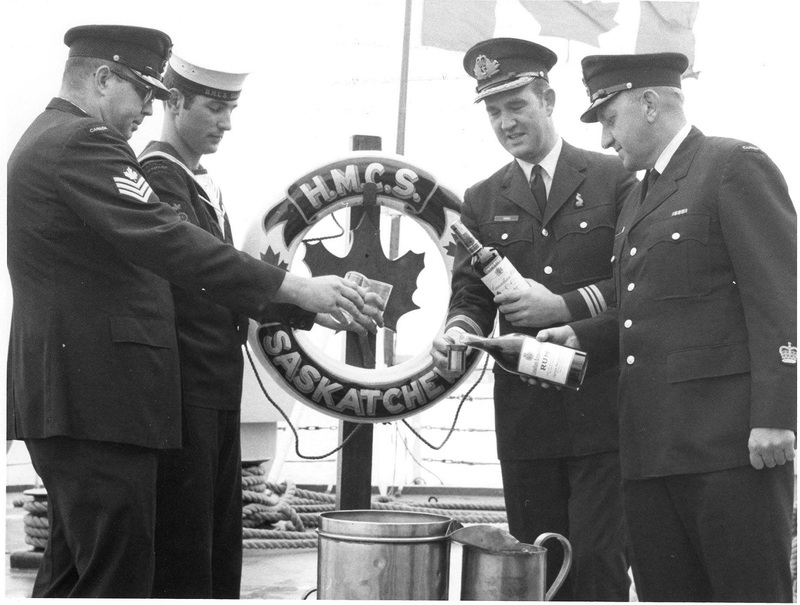 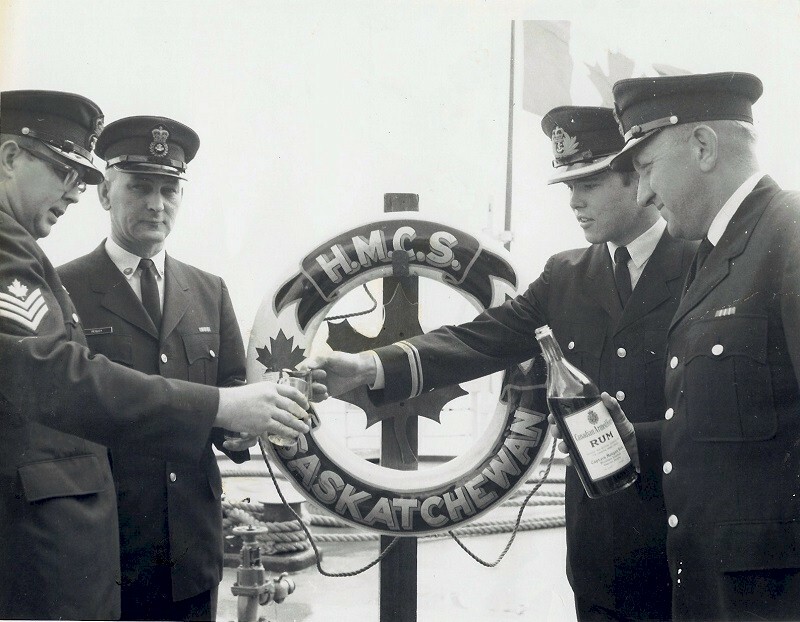 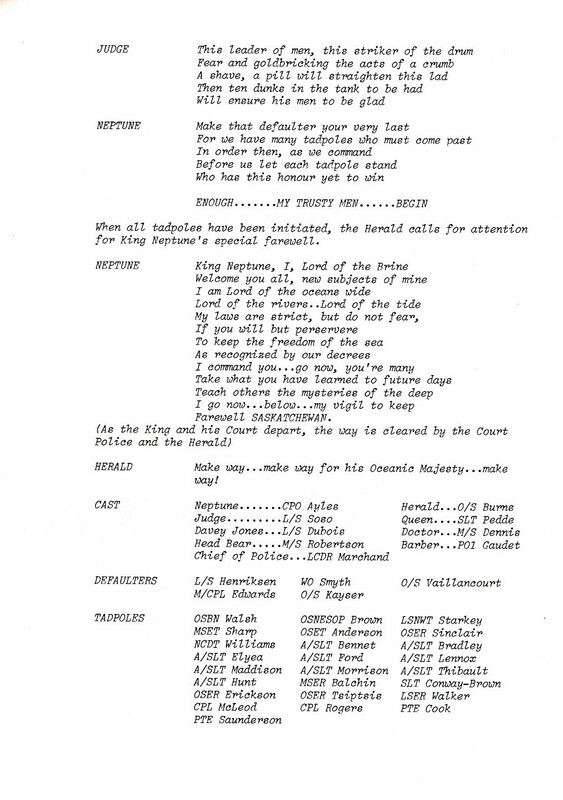 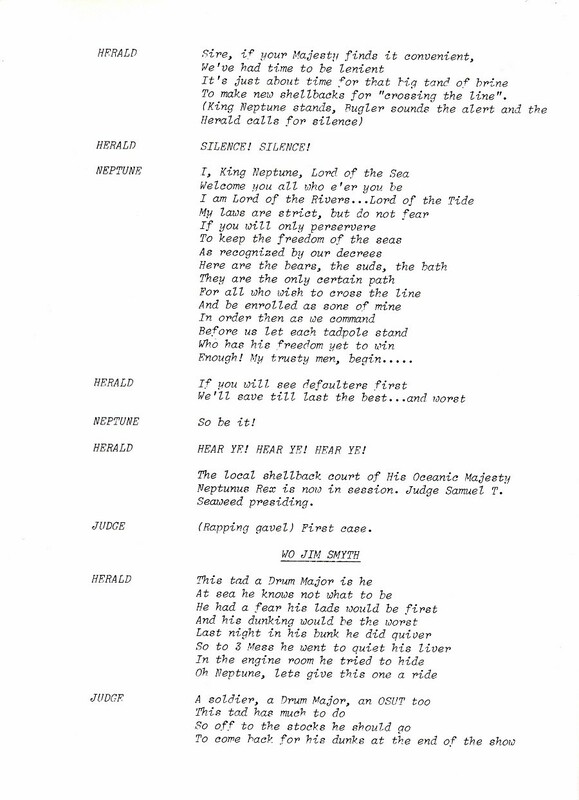 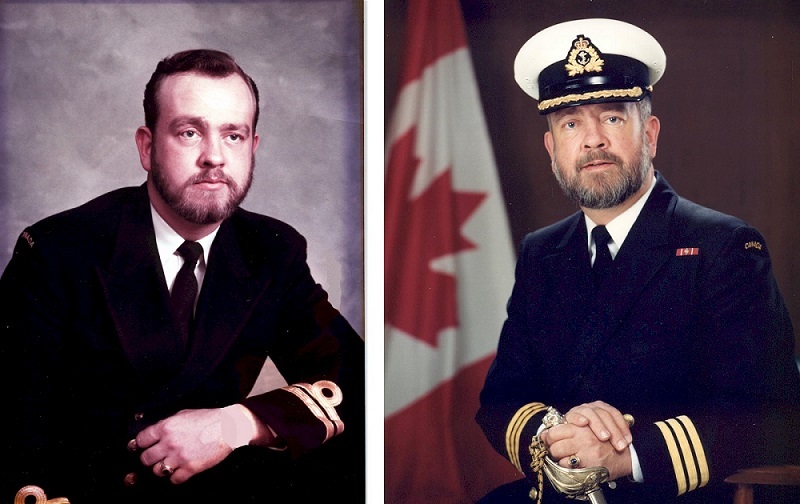 During Exercise SOPLOY '86, HMCS Saskatchewan conducted two Crossing the Line Ceremonies to initiate the unworthy into King Neptune's Realms. 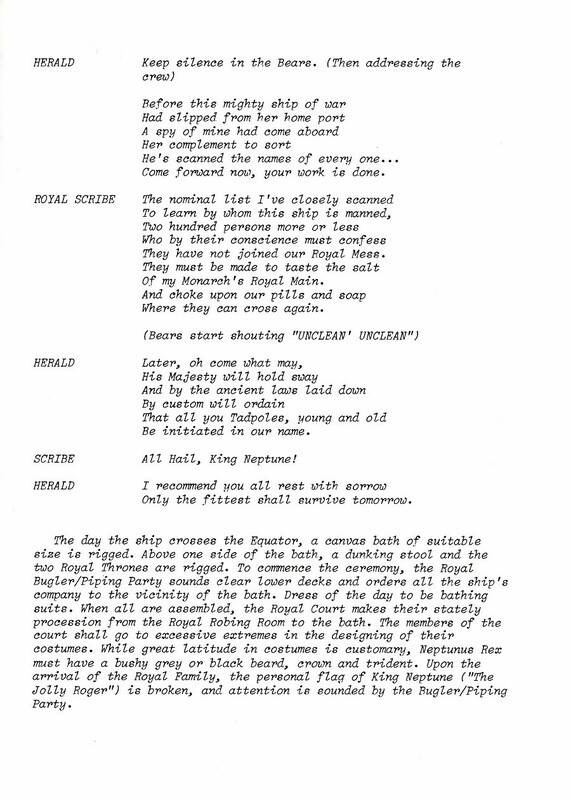 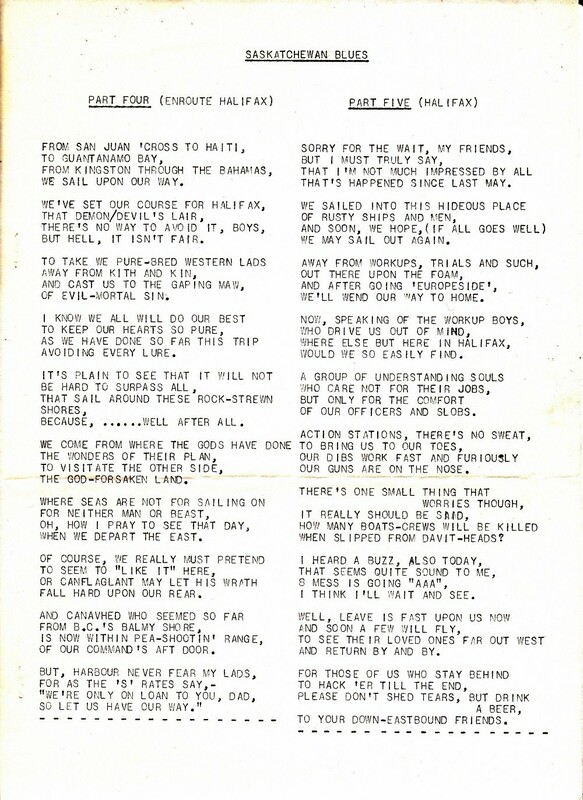 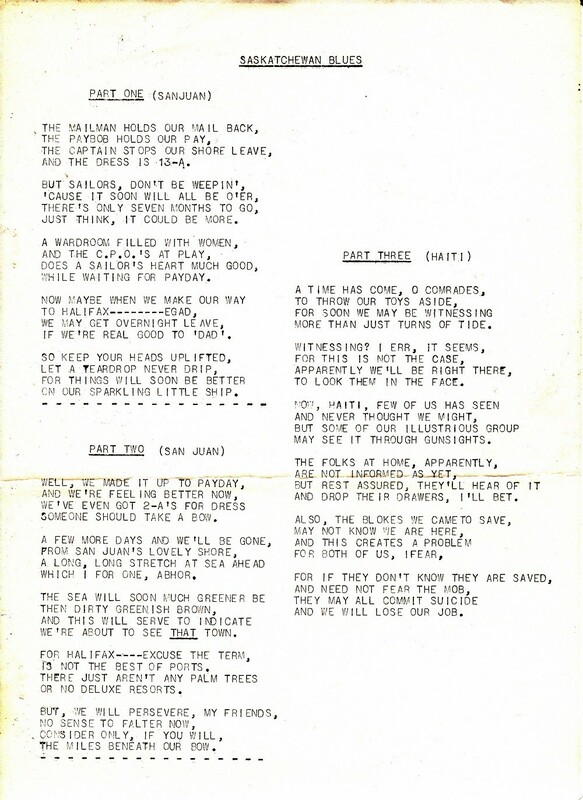 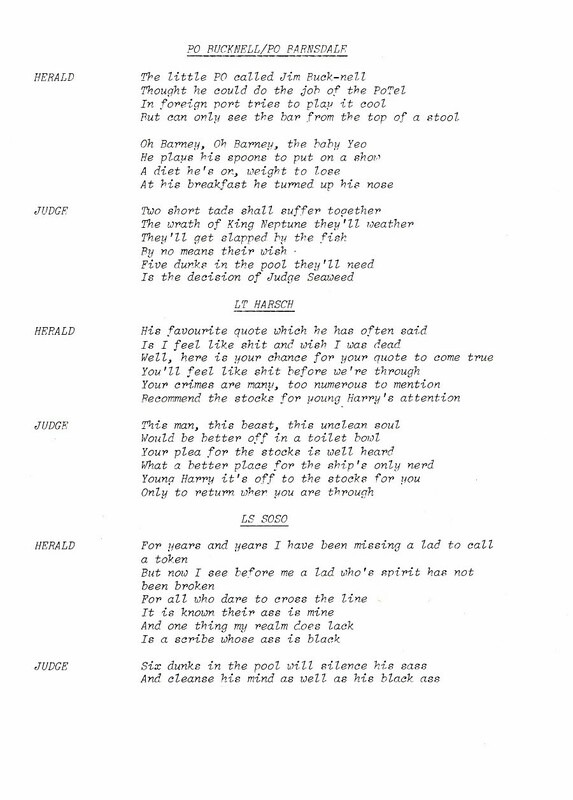 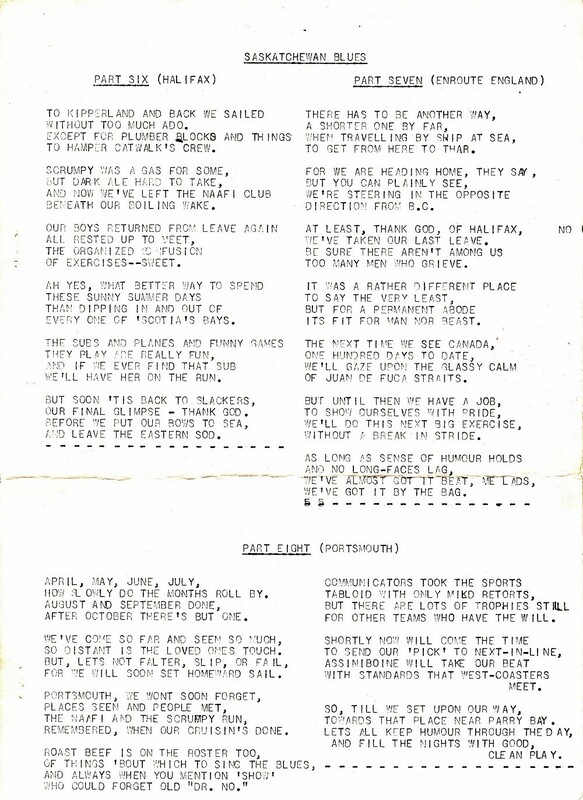 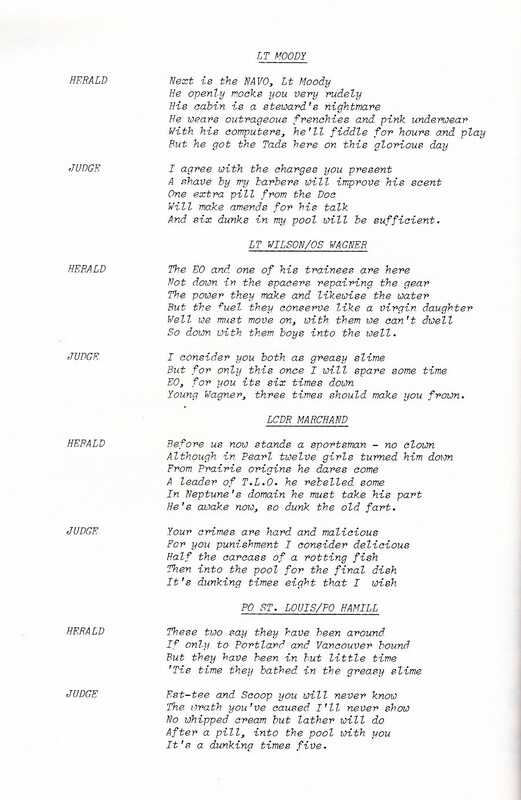 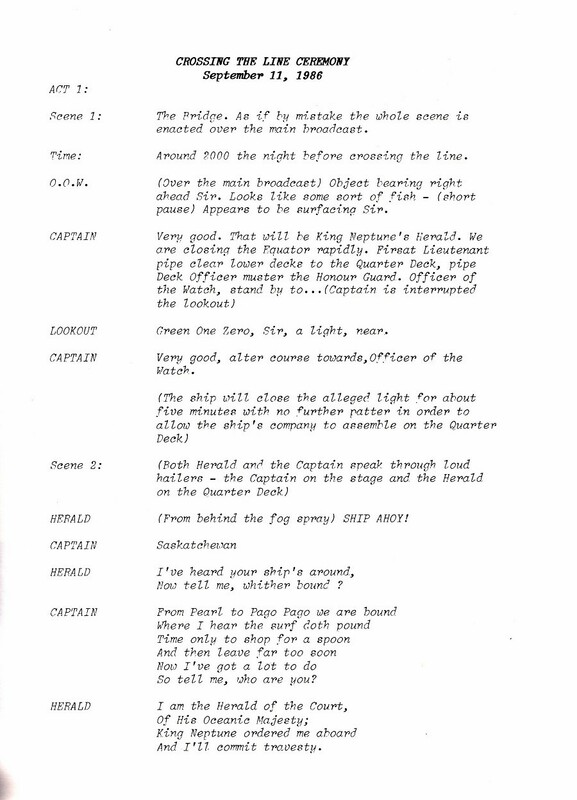 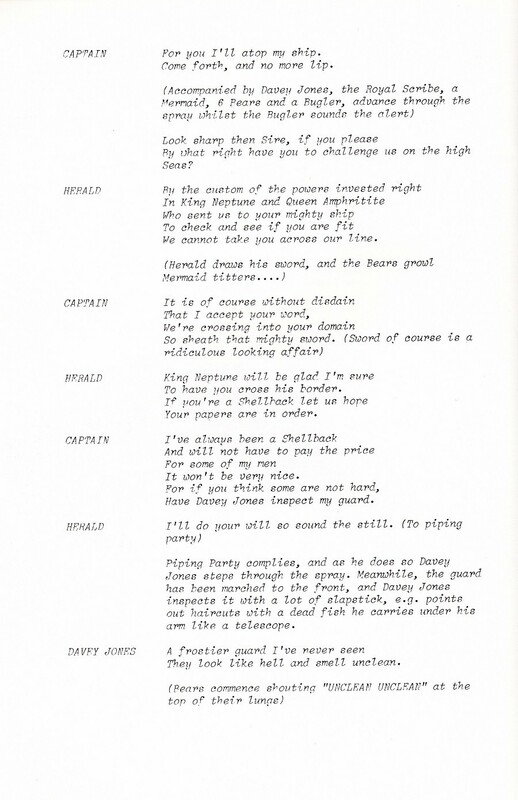 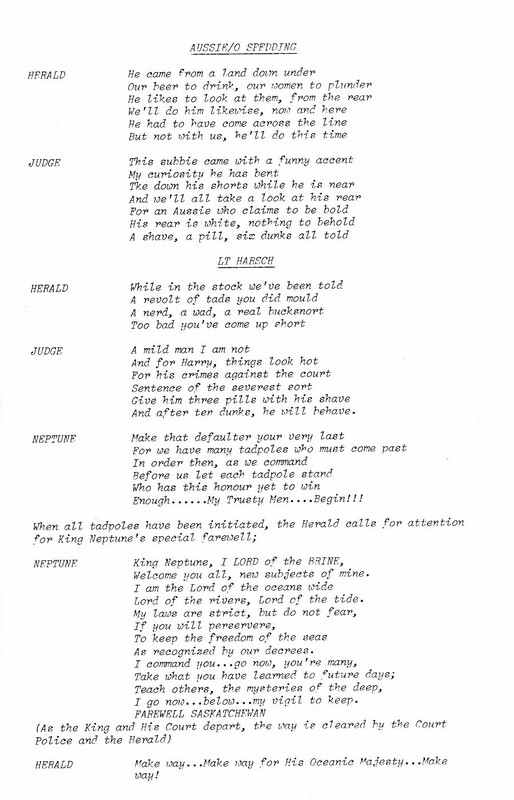 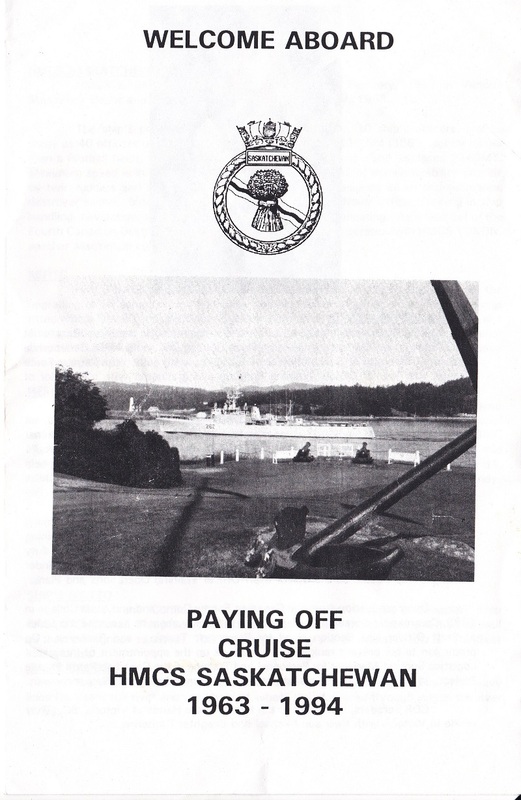 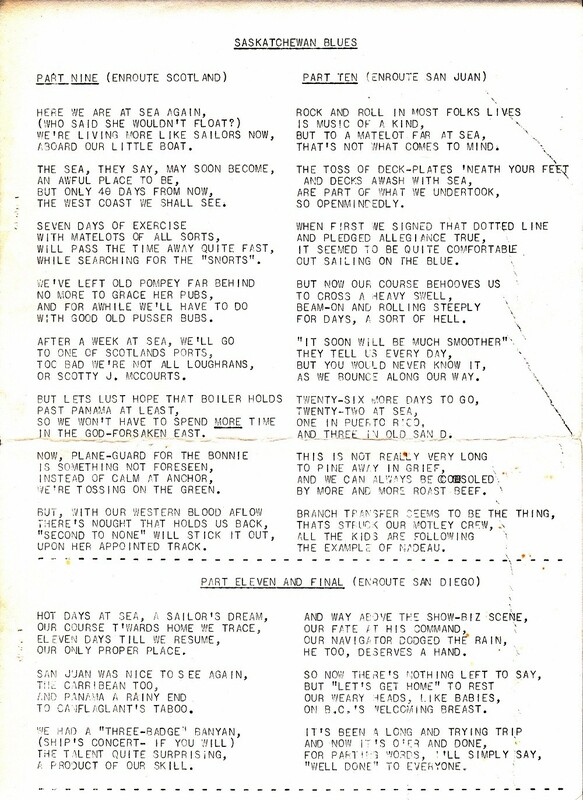 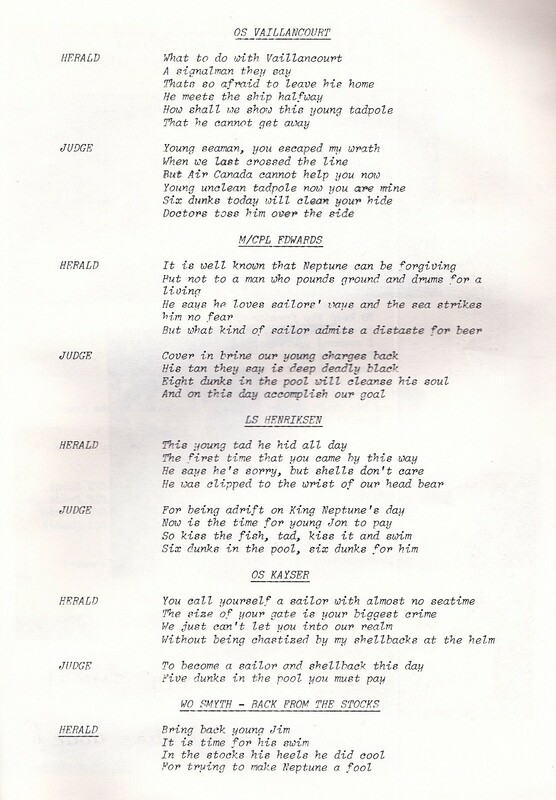 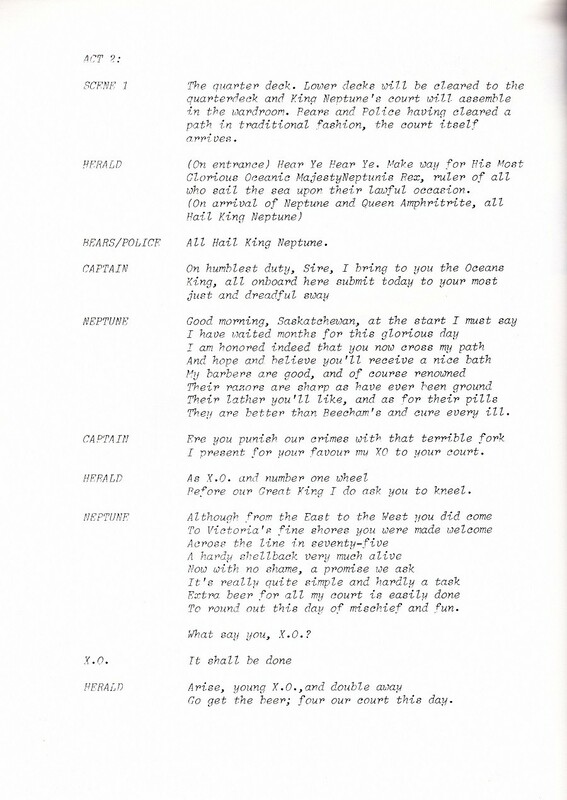 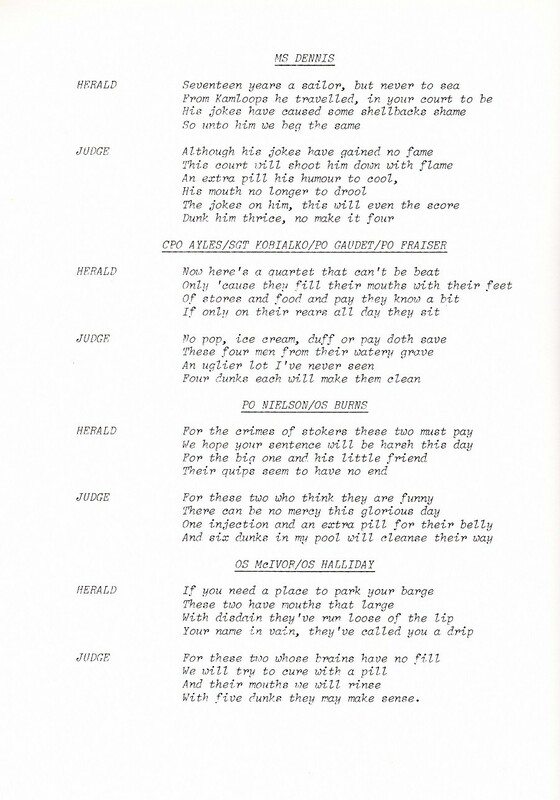 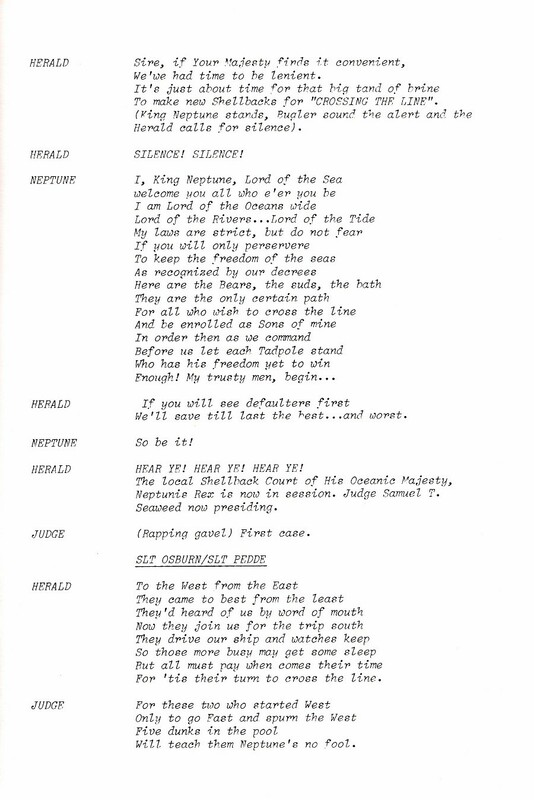 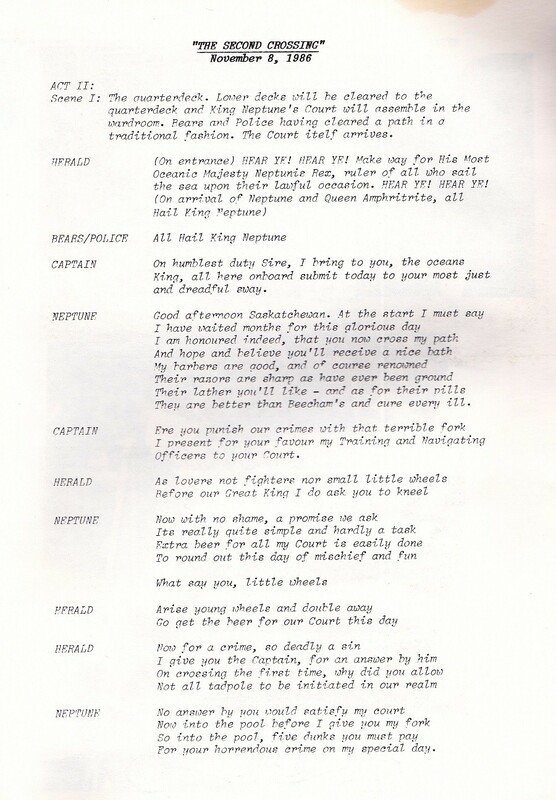 Herewith is an excerpt from her SOPLOY '86 booklet detailing the two crossings.